– This article is written for foreigners who are forming an LLC in the U.S.
– Make sure you’ve read what is an EIN and IRS taxpayer ID numbers. There is a lot of incorrect information online about non-US citizens and non-US residents (foreigners) getting an Employer Identification Number (EIN) from the IRS. Most of the information online is either wrong or incomplete, either due to lack of knowledge or because someone is trying to sell you something. At LLC University®, we don’t create content in order to sell you something. We create content in order to educate and inform. In this article, we will debunk a few myths, tell you the truth, and show you how to get an EIN for your LLC without needing an SSN or ITIN. EINs are completely free ($0) from the IRS. The only reason you would pay money is if you hire someone to get your EIN for you. While you certainly can hire someone to get your EIN, you can also apply for an EIN yourself. It’s not complicated and this article will walk you through the steps. You don’t have to be an American to get an EIN. You don’t have to be a U.S. citizen to get an EIN. And you don’t have to be a U.S. resident to get an EIN either. In fact, there are no citizenship or residency requirements to forming an LLC in the U.S. and there are no citizenship or residency requirements for getting an EIN for your LLC. As long as you complete Form SS-4 properly (which we’ll show you below), the IRS will give you an EIN for your LLC. You don’t need an SSN (Social Security Number) to get an EIN. You only need an SSN (or ITIN) if you want to apply for an EIN online. You can get an EIN without an SSN by sending Form SS-4 to the IRS by mail or fax. You don’t need an ITIN (Individual Taxpayer Identification Number) to get an EIN. In fact, you can’t even apply for an ITIN unless you need to file a U.S. tax return. Meaning it’s impossible to get an ITIN before forming your LLC because the LLC would first need to exist and generate income for a tax year, then when April 15th of the following year comes around, you would submit your U.S. tax return along with your ITIN application. You can get an EIN without an ITIN by sending Form SS-4 to the IRS by mail or fax. Note: If you read the IRS May 13th 2019 update that says you need an SSN or ITIN, that information is not true. It does not apply to non-US residents or non-US citizens. For more information, please see here: the IRS May 2019 requirements for EIN applications (and why most websites are wrong). You are not required to use a Third Party Designee to get an EIN. You only need to use a Third Party Designee if you are hiring someone to get your EIN, not if you are applying for the EIN yourself. You can get an EIN without a Third Party Designee by sending Form SS-4 to the IRS by mail or fax. While yes, you can certainly hire an attorney or an accountant to help you get an EIN (they’ll act as your Third Party Designee), you are not required to do so. You can get an EIN without an attorney or an accountant by sending Form SS-4 to the IRS by mail or fax. You can’t get an EIN online unless you have an SSN or ITIN. And even if you have an ITIN, many foreigners get an error message (an IRS reference number) at the end of the online EIN application and end up having to use Form SS-4. You can get an EIN by sending Form SS-4 to the IRS by mail or fax. While yes, the IRS does have a department called the International EIN Department (1-267-941-1099), as a foreigner who’s formed a U.S. LLC, you can’t call this number to get your EIN. This phone number is used for companies that were formed outside of the U.S., not companies formed inside the U.S. that are owned by foreigners. You don’t need a U.S. office address or U.S. mailing address to get an EIN. The IRS just needs a “mailing address”, which can be a U.S. address or it can be a non-U.S. address. However, if you want to open a U.S. bank account for your LLC, it looks much better when your EIN Confirmation Letter shows a U.S. address. For this reason, we recommend hiring Northwest Registered Agent ($125 per year). Northwest will let you use their address for your Registered Agent address, your LLC’s office address, and your EIN application so you can open a U.S. bank account for your LLC. Any mail that is sent to your LLC will be scanned by them and uploaded to your online account. Form SS-4 is called the Application for Employer Identification Number (EIN). Once you fill out Form SS-4 you can then send it to the IRS by mail or fax. Fax has a faster approval time than mail. We’ll discuss the details of how to complete Form SS-4 further below, but before we do, there are a few other important things to discuss first. Make sure your LLC is approved first before applying for your EIN to avoid having an EIN attached to the wrong LLC name (if your LLC filing gets rejected). You’ll also want to send to the IRS your LLC approval along with the EIN application. The name of your LLC approval form will vary depending on the state, but it will either be a stamped/approved Articles of Organization, Certificate of Organization, or Certificate of Formation. However, if you apply for your EIN first and your LLC is later approved, then there are no issues. The IRS doesn’t check to make sure an LLC exists first before getting an EIN, so if the LLC name on your state forms matches your EIN Confirmation Letter, you’re good. If you apply for your EIN first and then your LLC is rejected because of a name conflict, you’ll need to resubmit your LLC filing forms, get a new EIN, and then cancel your first EIN. You don’t have to wait for your first EIN to be cancelled before getting a new EIN. The only exceptions are if you’re forming an LLC in Louisiana or West Virginia where you may need to get your EIN before forming your LLC. An EIN is primarily used by foreigners to open a business bank account in the U.S. for their LLC. Your EIN will also be used for U.S. tax reporting and filing requirements, hiring employees (if applicable), and sales tax licenses/permits. Your LLC’s EIN will also be used for account registrations for Amazon FBA, eBay, Youtube, Google Adsense, Paypal, Shopify, Stripe, and many more. Many foreigners have online businesses these days, like dropshipping, affiliate marketing, blogging, and freelance work, where they need an EIN for their LLC. You can either print the form, fill it out by hand (use a black pen), then sign; or, you can type in the form on your computer, then print and sign. If you are filling out Form SS-4 by hand, we recommend using ALL UPPERCASE letters. The IRS prefers UPPERCASE letters and this can help speed up your EIN application. You’ll see an “EIN” box in the upper right of the form. DON’T ENTER ANYTHING HERE. The IRS will enter your EIN number in this field after they approve your application. Enter your LLC name in the exact same way it’s listed in your Articles of Organization, Certificate of Organization, or Certificate of Formation. Note: If you’re forming an LLC in Louisiana or West Virginia, you may need to obtain your EIN before forming your LLC, so make sure your LLC name is available (or you’ve reserved it, as per Louisiana filing instructions) before getting an EIN for your soon-to-be LLC. If you’re forming your LLC in any other state, don’t apply for your EIN until your LLC is approved. Most foreigners who have formed an LLC don’t also have a Trade Name (aka DBA, Doing Business As, or Fictitious Name). Most foreigners leave #2 blank. If on the other hand, you’ve filed a DBA after forming your LLC, your DBA is owned by your LLC, and you want your LLC to do business under that name, then you can enter your Trade Name/DBA Name/Fictitious Name in #2. Leave this blank. This field does not apply to LLCs obtaining an EIN. On lines 4a and 4b enter a mailing address where the IRS can send you reminders and tax documents. This address can be a U.S. address or it can be a non-U.S. address. This address can be the same address you used listed on your LLC filing forms, but it doesn’t have to be. This address should be one that is reliable and where you can regularly receive mail for your LLC. This should also be the address that you will use when filing future tax returns with the IRS. However, using a U.S. address here may make it easier when opening up a U.S. bank account. The address that is listed in 4a and 4b will be the same address that is listed at the top of your EIN Confirmation Letter. Some banks accept this as a proof of U.S. address. The best and least expensive way to get a U.S. address (if you don’t have friends or family in the U.S.) is to hire a Registered Agent that will allow you to use their address not only as your LLC’s Registered Agent address, but also as your LLC’s office address. The company we recommend for this is Northwest Registered Agent ($125 per year). They’ll let you use their address for your U.S. LLC and any mail that is sent to your LLC will be scanned and uploaded to your online account. They are a great company and have been in business for over 20 years. • If the address is a non-U.S. address, make sure to enter the city, province (or state), postal code, and the name of the country. Enter the full country name, don’t abbreviate it. • If you need to change your LLC mailing address in the future, you can always do so by filing Form 8822-B with the IRS. It’s free to file Form 8822-B. You can leave 5a and 5b blank. Enter the county (not the country) where your LLC is located in the U.S. This will either be your LLC’s principal address or your LLC’s Registered Agent address. Tip: To find out what county your LLC’s address is located in, you can use the following tool: What County Am I In. The EIN Responsible Party must be an individual person, therefore, it will be an LLC Member (owner). If you own a Single-Member LLC, you will be the Responsible Party. If you own a Multi-Member LLC, any of the LLC Members (owners), including yourself, can be the Responsible Party. This is the box that confuses most people who don’t have an SSN or ITIN and want to get an EIN for their LLC. The solution is to enter “Foreign”. The IRS issues EINs to foreigners all the time and this is what you must enter if you don’t have an SSN or ITIN. Note: If your LLC is owned by another LLC (a “Parent LLC”), you can’t use your Parent LLC’s EIN. You must enter “Foreign”. And you also must list a person (not a company) in 7a. 8a. Is this application for a limited liability company (LLC)? Enter the number of LLC Members (owners) for your LLC. Multi-Member LLC: Enter the total number of Members in your LLC. Note: If your LLC is a subsidiary owned by another company (or companies), enter the number of companies that own this LLC. 8c. If 8a is “Yes,” was the LLC organized in the United States? Check off “Yes”. Although your LLC will be foreign-owned, your LLC will still be organized in the United States. • We recommend that you have a conversation with an accountant before deciding how your foreign-owned LLC will be taxed. • The term “foreigner” means non-resident alien. • The term “U.S. person” means U.S. citizen or U.S. resident alien. You will pay U.S. taxes based on what country you are from, what tax treaty is in place, how and where your LLC makes money, where your clients are, if your LLC has a “permanent establishment” in the U.S., if your LLC’s income is “effectively connected” to a U.S. trade or business, and much more. Taxes are complicated for U.S. residents. Taxes are more complicated for foreigners, so please speak with a professional. We are unable to provide tax assistance or tax advice. Thank you for understanding. If you have a foreign-owned Single-Member LLC you can choose to be taxed as a Disregarded Entity or as a C-Corporation. – If you want your LLC to be treated as a Disregarded Entity, check off “Other (specify)” and enter “Foreign-owned U.S. Disregarded Entity” on the line. – If you want your LLC to be treated as a C-Corporation, check off “Corporation (enter form number to be filed)” and enter “1120” on the line. After you receive your EIN you must then file Form 8832 to make your C-Corporation election. • All foreign-owned Single-Member LLC Disregarded Entities must file Form 5472 every year. More information here: Form 5472 and foreign-owned LLC. • If your Single-Member LLC is owned by a foreign company, your LLC will be considered a branch or division of the parent company for tax purposes. • If you are considering LLC taxed as C-Corporation (which is not very common), please see here: LLC taxed as C-Corp. If you have a foreign-owned Multi-Member LLC you can choose to be taxed as a Partnership or a C-Corporation. – If you want your LLC to be treated as a Partnership, check off “Partnership“. Note: The same thing will apply to Multi-Member LLCs that are owned by a foreigner (or foreigners) and a U.S. person (or persons). You can choose for your LLC to be taxed as a Partnership or a C-Corporation. If you are considering LLC taxed as C-Corporation (which is not very common), please see here: LLC taxed as C-Corp. Enter the state where your LLC was formed. Use the state’s full name. Don’t use an abbreviation. For example, enter “Florida”, not “FL”. Note: This lesson is written for foreigners who have formed an LLC in the U.S., not for people who have formed a company outside of the U.S. and are now bringing that company to the U.S. Select “Started a new business (specify type)” and enter the type of business your LLC will be engaged in to the right. The best place to start is to look at the options in #16. If one of the default checkboxes in #16 matches your LLC’s business purpose, then just enter those words here in #10. If not, enter a word (or words) you see fit, or you can use language from the NAICS Code, which is the business classification system used by the IRS. The NAICS Code (North American Industry Classification System) is used by government agencies to identify a business’s line of work. Statistical purposes which are used to produce reports and industry analysis. In the case of an audit, the IRS will know how a business may compare against similar businesses in the same industry. Just use the word (or words) that best match your LLC’s business activity. Note: Although your foreign-owned LLC may have multiple purposes, multiple products or services, and multiple revenue streams, just enter the primary business activity. And don’t worry, this doesn’t force your LLC into doing this forever. You can also change your LLC’s line of work at any time and you don’t need to update the IRS. This information is just needed on the LLC’s initial EIN application. Enter the date (month, day, and year) your LLC was approved by the state (aka the LLC effective date). Look on your approved Articles of Organization, Certificate of Organization, or Certificate of Formation (different forms for different states) for your LLC’s approval date. This is the date your business started, even if there wasn’t actual business activity. Most foreigners run their taxes on the calendar year, which is January through December. If that’s the case for your LLC, enter “December”. Note: Most foreigners won’t have U.S. employees, so this section may not be applicable. Most foreigners will be entering “0” “0” “0” in #13. When hiring a W-2 employee, as their employer, you must withhold income taxes, withhold and pay Social Security and Medicare taxes, and pay unemployment taxes on their wages. On the other hand, you can hire 1099 independent contractors, in which you are not responsible for withholding and paying the above taxes. We cannot help you determine whether someone is an employee or an independent contractor, however, you can speak with your accountant, in addition to reading the following information provided by the IRS: employee vs independent contractor. If you plan to hire U.S. employees within the next 12 months, then enter the approximate number of employees in each category (Agricultural, Household, and Other). If there won’t be employees in a certain category, enter “0”. Don’t leave a field blank. If you won’t be hiring U.S. employees within the next 12 months, you’ll need to enter a “0” “0” “0”. An agricultural employee is someone who works on your farm and may take on various roles, such as harvesting agricultural or horticultural products, raising livestock, operating machinery, clearing land, and more. For more details on agricultural employment, please see page 9 of the following IRS guide: Agricultural Employer’s Tax Guide. A household employee is someone who works in or around your home on a regular and continual basis. Think of wealthier people who employ people in their home on a regular basis. Some examples are maids, housekeepers, babysitters, and gardeners. And keep in mind, this isn’t the same thing as hiring these people in an independent contractor scenario. For more information on what determines a household employee, please see this page from the IRS: household employees. For the majority of foreigners who have (or plan to have) U.S. employees, their employees will likely fall within the “Other” category. Important: Just being an owner of your LLC does not make you an employee of your LLC. Note: Most foreigners won’t have employment tax liability, so this section may not be applicable. Most foreigners will just leave the box unchecked. If you have (or will have) U.S. employees, you’ll need to withhold and pay certain taxes to the IRS on behalf of your U.S. employees. Please speak with your accountant to first estimate your employment tax liability. If your employment tax liability will be less than $1,000 in an entire calendar year, you can choose to file Form 944 annually (instead of filing Form 941 quarterly). If you’d like to do that, you’ll need to check the box in #14. Note: Most foreigners won’t have wages or annuities paid, so this section may not be applicable. Most foreigners will just enter “N/A”. If you don’t have employees, enter “N/A”. If you have U.S. employees and have already begun paying wages (or annuities), enter the date (month, day, year) they were first paid. If you have U.S. employees, and you’re not sure when you will begin paying them, just enter an estimated date. Don’t worry, the IRS isn’t going to hold you to it and it won’t mess up your EIN application. You’re simply just giving them an approximate heads up. You can make #16 match what you entered in #10. Check a box if it’s applicable or select “Other (specify)” and enter whatever you entered in #10. #17 is just asking for a little more details regarding your LLC’s principal business activity. The IRS wants to know, within that type of business activity, what is your primary product being sold, service being offered, type of construction being done, or line of merchandise you’re selling. Just enter a few words to explain your LLC’s principal business activity. 18. Applied for an EIN before? If you’ve applied for an EIN for this LLC before, select “Yes” and enter the previous EIN. Name and title: Enter your full name and title. If you are the LLC Member (owner), use the title “Member”. For example, “John Smith, Member“. Signature and date: Sign your name and enter today’s date. Applicant’s telephone number: Enter your phone number. This can be a home, office, or cell number. This number can be a U.S. phone number or it can be a non-U.S. phone number. If you’re entering a non-U.S. phone number, make sure to put the country code at the beginning of your number. If you are submitting SS-4 by mail, you don’t have to enter a fax number. You can just leave this blank. If you are submitting SS-4 by fax, then you must enter your fax number. If you’re using a digital fax like we recommend below, the number will be a U.S. fax number. You can also use a non-U.S. fax number here. Page 2 is just an informational page and you don’t have to submit it to the IRS. Although, if you happen to send in Page 2, don’t worry, the IRS will just throw it away. We recommend making a few copies of Form SS-4 before sending to the IRS. Just keep the copies with your LLC’s business records. Along with your Form SS-4, send the IRS your LLC approval. Depending on the state where you formed your LLC, this will either be a stamped/approved Articles of Organization, Certificate of Organization, or Certificate of Formation. Approval time by mail is 4 to 8 weeks. Approval time by fax is 4-7 business days. Note: There is no street address (ex: “123 Main Street”) for the IRS. The above address is the complete address. You don’t need a cover sheet with your fax. You can just just fax page 1 of Form SS-4 to the IRS. It’s best to fax from inside the U.S. and the easiest way to do this is by using a digital fax service. This way, when the IRS faxes you back your EIN Confirmation Letter, the digital fax service will just deliver it to your email. We recommend getting a U.S. phone number from Phone.com. Their phone plans are only $13 per month and they automatically include the fax feature at no additional cost. After you sign up with Phone.com, you can just call their support team or do a live chat and they’ll show you how to send a digital fax. It should only take you a few minutes. Once in your account, click “Fax” in the upper right corner. Then enter the IRS fax number (1-855-641-6935) at the top, followed by your name and email. Set the fax quality to “high” and then click “Choose File” under “Add Attachments”. Once ready, click the “Preview Fax” button at the bottom. On the next page you’ll see a note about “FCC regulations require us to use a US geographical caller ID when sending faxes to toll-free numbers”. This is just phone.com letting you know that your “from” fax number will be different. But don’t worry, this will not impact your EIN fax application with the IRS at all. 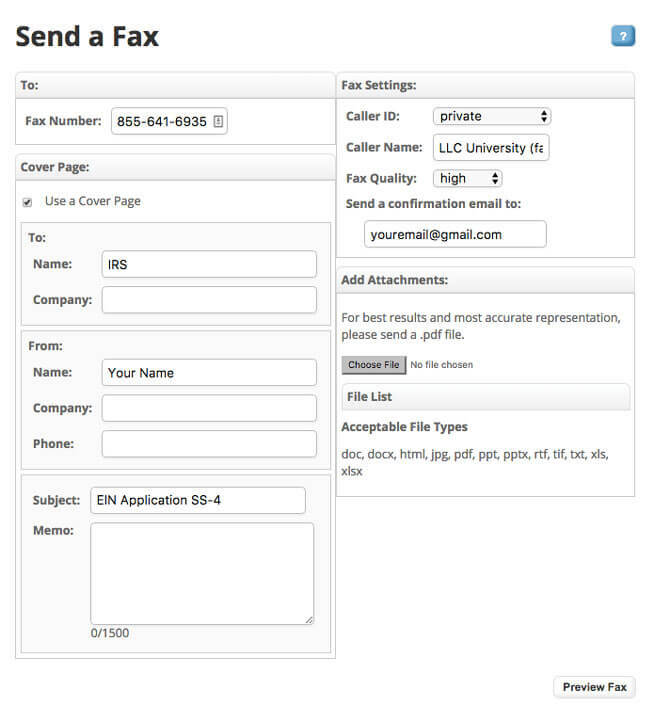 Click the “Send Fax” button at the bottom to fax your EIN application to the IRS. Congratulations. Your EIN application has been sent to the IRS for processing! Now you just need to wait for your EIN approval. Once the IRS approves your EIN you will receive an EIN Confirmation Letter. This is your official EIN confirmation and it is also called a CP 575. Your EIN confirmation letter will be sent back to you the same way you sent Form SS-4 to the IRS. If you mailed Form SS-4 to the IRS, they will mail your EIN approval. If you faxed Form SS-4 to the IRS, they will fax your EIN approval. You will get your EIN Confirmation Letter by mail within 4 to 8 weeks. You will get your EIN Confirmation Letter by fax within 4 to 7 business days. The above approval times are estimates provided by the IRS. However, depending on what time of the year you file Form SS-4, things may take a little bit longer so please remain patient. The IRS is busier in the first 5 months of the year (January through May). Although it says “SSN, ITIN, or EIN” on line 7b, you can’t enter an EIN here (unless you are a government entity). In 2018, the IRS made changes to the rules of Form SS-4, and the EIN Responsible Party can’t be a company. And you can’t enter an EIN. The Responsible Party must be an individual person. For more information, please see this article: who can be the Responsible Party for my LLC. If you have a foreign-owned Single-Member LLC, you must also file Form 5472 and Form 1120. If you don’t, the IRS can charge penalties of $10,000 USD or more. For more information, please see this article: foreign-owned LLC and Form 5472. This page does not discuss additional tax requirements that foreigners must follow in order to properly report and file taxes with the U.S. government. You will need to hire an accountant/tax professional who works with foreigners that have a U.S. LLC. How to find an accountant for a foreign-owned LLC? The best way to find an accountant for a foreign-owned LLC is to use our “knights of the roundtable” strategy + the IRS Acceptance Agent list. The IRS Acceptance Agent page lists tax professionals that work with foreigners. You’ll want to find about 5-10 tax professionals that are located in the same state where you formed your LLC. Write down their information and call them all and ask a few questions. Each tax professional will give you a few minutes of their time for free since you are a potential customer. Then use our “knights of the roundtable” strategy when making your phone calls. This will help you eliminate bad candidates and find the best tax professional for your LLC. The U.S maintains tax treaties with over 60 countries around the world. These treaties usually include disclosure agreements, where each government agrees to share information on a person or LLC’s taxable activity outside their country of origin when requested by his home country. The agreements are in place to make sure that people and companies who earn income outside their home country file the proper returns and pay their taxes in both the U.S. and in their home country. U.S. banks don’t all do things the same way. Things vary from bank to bank. Things vary from state to state. And even within the same state and within the same bank, things can vary from branch location to branch location. However, in general, nearly all banks will allow you to open a business checking account for your foreign-owned LLC. While there are some online banking solutions for foreigners (like Payoneer, OFX, and World First), these are not true U.S. banks and they each come with their pros and cons. There are typically two solutions for foreigners who want to open a U.S. bank account for their LLC. You may be able to open a U.S. business banking account for your U.S. LLC by visiting the branch in your home country. You’ll want to call the bank ahead of time and make a detailed list of what documents are required. You’ll want to make sure the bank can open a U.S. bank account that is located in the same state where you formed your U.S. LLC. First do google searches for banks in the same state where your LLC was formed. Than call and ask to speak to the branch manager. Tell them you are a non-resident alien and want to open a business bank account for your LLC. Ask them what documents are required. You’ll need to show proof of identity (foreign passport and foreign driver’s license) and you’ll need proof of business address. Usually your approved LLC filing and EIN Confirmation Letter may work, but a bank may also ask for another proof of address, like a phone bill or a lease. The International Department at 1-267-941-1000. Hours are Monday through Friday, 6am – 11pm, U.S. Eastern Time. The EIN Department at 1-800-829-4933. Hours are Monday through Friday, 7am – 7pm, local time. It’s important to know that the IRS will answer general questions, but they don’t give out tax advice and can’t explain every single requirement to you over the phone. For that reason, as we’ve mentioned earlier, it’s a good idea to find an accountant for help. Awesome, I found this article while I was filling my form to apply for an EIN, and it really helped me a lot understand a lot of things in the right and correct way. Would please write a guide for non-US people who want to apply for an ITIN number? Do we really need to go through an IRS ecceptance agent to fill the form W-7 to get an ITIN number? Hey Kim, we have instructions here: how to get an ITIN. Hope that helps! LOVED YOUR ARTICLE, EASY TO UNDERSTAND AND INFORMATIVE ON HOW & WHY TO FILL OUT THE FORM , THANKS A LOT!!! You’re very welcome Lizzie! Glad to hear it was helpful! Awesome guide! Thank you very much, that helped a lot! Quick question, if I get an EIN for my LLC is there a way to file a tax return without an ITIN number, or do I need to get my ITIN anyway at some point? You’re very welcome Demian! You’ll need to file your tax return by mail, along with your ITIN Application (Form W-7 and required documentation). In any field that asks for SSN/ITIN, you can write “Applied for”. Hope that helps. Most amazing guide I have ever read online about forming LLC ! Thank you for your amazing work for helping all of us about our questions! I have a quick question as well. I’m a non-US person and dont have an SSN number and trying to apply for EIN. in the SS-4 form section 9a. I’m not sure what type of entity I should check box? *I’m doing an e-commerce business and I thought I would check box “Sole proprietor (SSN)” but I dont have an SSN number. Awesome info, have been looking for something like this for weeks, thanks Matt! Hi Matt, thanks for the detailed and amazing info, one question regarding getting EIN as a foreign national, will a foreign person get approved for EIN if they are illegally in the country? is the government going to be looking into a person’s legal status when they are applying for EIN? Hi Dino, interesting question. We’re not sure. You may want to call the IRS and see what they say. If you do, feel free to share any findings. We’re curious to see what you come up with. Thanks. hello, I am Little bit confused that do i need to fill the From5472 while applying for EIN?. As mentioned in your detailed Blog above. As I am Indian and a non-resident of US..
Hi Manpreet, the EIN would be obtained first, then you’d file Form 5472 every year when taxes are due. More information is here: Form 5472 for non-US resident LLC. Hope that helps. So Form 5472 must also file and those people who have only an EIN (without LLC)? Because in your article: https://www.llcuniversity.com/irs/form-5472-foreign-owned-llc/ you said LLC owners only must file that Form5472. So only EIN owners also must file Form 5472 every year, right? For example, in my case, I’m gonna obtain an EIN soon (without registering LLC) to get verified in Stripe so I will also have to file Form 5472? Hi Yaroslav, the requirement is only for Single-Member LLC that are foreign-owned. If you’re not forming an LLC, you don’t have to worry about Form 5472. Need an LLC, without SSN, and a foreigner. This is for my nephew who lives with me now. It’s been 3 months. He needs a company so he can get paid. Hi Aless, your comment is a statement, not a question. I’m not sure what you’re asking. Thanks. You have solved my problems with ITIN, tax return and opening account and LLC in the USA, save my money and time. The best explanations in the world. Thanks. Hey Dmytro, that’s awesome to hear :) Thanks so much! I am impressed from your guidance. I have another query that how can I open an Physical bank account without visiting US. As i am indian, non resident of USA. Already Got certificate of registration for me new Pennsylavnia LLC. and plzz guide me which bank will gave me a bank account in pennsylvania. you also suggested people to open a bank account same bank branch as in our homecounrty, but my LLC name in pennsylavania is different from my Home counrty Company.if i will open an account on my legal name in branch like HSBC bank in india and transfer account of HSBC in pennsylvania, So this Bank Account On my Own Legal name is acceptable ? And i am waiting for EIN, because of shutdown of IRS, you have any idea, for how much time we have to wait more? Hey Manpreet, glad to hear the page was helpful! No news on the when the shutdown will be over, but we hope soon. We have details on banking for non-US residents here: non-US resident opening U.S. bank account for LLC. Hope that helps. I’ve subscribed to phone.com as recommended. Any other tips on getting this EIN approved more quickly than mailing in the application? Thanks for creating an EPIC site!!! Hey Frederick, we just added a note to the top of the page. Unfortunately, we’re dealing with the temporary U.S. government shutdown. So you’ll want to wait until the shut down is over, then just re-fax then. Wish we had better news, but everyone is dealing with this issue currently. It’s just about being patient at this point. I’ll be flying out before this thing is over with. Very interesting government here lol. I former a 3 member foreign LLC recently. However i just saw that i forgot to add my middle name in the documents. Would that affect anything from EIN, ITIN to Business bank accounts? As all my documents include my middle name. And if yes, what is the method of amending the LLC information? Hi Burke, you shouldn’t have to worry about that. There is a small chance that some bank person may be a pain in the neck and want everything to match, but that’s super rare. And if that does happen, you can just go to a different bank. If you needed to update that, the form is usually called a Certificate of Amendment, or something similar (it depends on the state). Hope that helps. How can I get an EIN now with the government shut down? Hey Eran, the government shutdown is now over :) You can proceed as normal. Will I need to attached my LLC Certficate when I sending Fax? Or it’s just necessary with sending Post? Great question. You should include it with your application, where sending by mail or fax. Hope that helps. You really helped a lot to get a clear idea on how to get things done… saved me quite a bit of money! Best guidance with step by step instructions so even an 8 y/o can do it. I do have a question and hope you can help me. Since the shutdown is over but need to open the bank account asap, I will be adding a US member with an SSN to do it online. Do you have any idea how I can make the ammendment and ideas on costs? Hey Mario, we’re very happy to hear that! Are you trying to amend your LLC filing with the state or change your EIN responsible party? If the second one, you can find that info here: changing EIN responsible party for LLC. Hope that helps. Thanks for this great article it’s clear and comprehensive, I have couple of questions related to LLC formation. I am US citizen from Minnesota helping out my friend to setup LLC as a registered agent here, he is in India, can I apply for EIN for his LLC using my SSN?, it’s Single Member LLC owned by him alone. This business involves buying a product from one place and selling it to customers in any of 48 states in continental USA, this company is registered as LLC in Minnesota, is it required to register it as foreign LLC in all the other 47 states as the customers can potentially from those states ? Please advice. Hi Saravana, you’re very welcome. You’ll want to check out who can be EIN responsible party for LLC. It needs to be an actual owner of the LLC. No, you likely won’t have to register as a foreign LLC in all those states, however, if you have nexus, then their LLC may have to report/file sales tax in those states. Hope that helps. I would like to thank you for all your guidance on obtain the EIN. I have faxed my application to the IRS over a week ago (7 days today). I understand that due to the shutdown and it being Tax season that this might be delayed further so I was wondering if there is a way to at least confirm they have received my application. I really appreciate any recommendations you or anyone else might have. Thank you, Catherine. Just an update. Finally received my EIN. Took just over 3 weeks. Happy that is all done…Thanks again for all your assistance. Hi Catherine, What is your date of application? Hi Saravanan, l sent the fax on 29 Jan and got the EIN on 15 Feb. They did not fax it to me though. They sent it to my registered agent (Northwest, as theirs was the address I used on my application) and then they put it up on my account. Did you apply with an ITIN or without? I applied without an ITIN as a foreigner using the method described above but it’s been over 2 weeks and I haven’t received any update. I’m worried that my application may not work and I am limited on time. I applied just like you. No ITIN, as a foreigner. It took just over 2 weeks to get the number. I have to mention that they sent the reply to the address I had on the application not the fax. Hope this helps. Hey Catherine, thanks for all your helpful replies! That’s weird that they mailed your approval to you instead of faxing it. We haven’t seen that before. On your Form SS-4, did you enter your complete fax number (with area code) in the lower right (“Applicant’s fax number”)? Hi Matt, yes I did. I am guessing that they preferred to send it by mail, as the address was my registered agents, Northwest, rather than faxing an international number. Again, this is my assumption. Hi Catherine, I think it would be more likely due to the fact that the fax number was non-US. This is great to know. We may need to update the information on this page. Maybe they had issues faxing it back or maybe when they see a non-US fax number, they just mail it. Thanks for the details! Hi Saravana, I’d allow a few more weeks. The IRS is likely catching up on the backlog from the shutdown. Since you are promoting Northwest, and I have no problem with it, that as a foreigner looking to create a new LLC via them, that they will charge you an additional $200 to obtain the EIN. This is not mentioned anywhere on their website. In turn the use a * to say you need an SSN. This is a bit of a sneaky move and will catch customers out more often than not. You will essentially be paying for a service that won’t be done unless an additional amount is paid. Hey Stephan, thanks for your comment. We are actually working on a new design with Northwest, so we will make sure that it is extra clear. You’re right… you don’t know up front that it costs $200 extra for that service (if you don’t have an SSN). Yea, that’s an issue. Thanks for bringing this to our attention! We will get this fixed and make it more clear as soon as possible. We have a 2 members LLC in Florida But none of us is US resident. We sell trough Amazon.com and they have sent us the 1099 form. How can we report 2018 taxes, if we don’t have SSN. Did we make a mistake opening a LLC ? Hi William, you don’t need an SSN to report and file taxes in the US. You’ll want to get in touch with an accountant who works with non-US residents. You’ll need to file a 1065 Partnership Return for the LLC. You likely don’t need to file Form 8832. I don’t think you made any mistakes. It’s just tax time is coming up in April. That’s all. Hope that helps. I filed papers for LLC 12/21/18 approved on 01/03/19 in Florida. Please help me – I do not know who is going to create my LLC. What date do I need to write in SS-4 #11: Date business started or acquired (month, day, year)? Do I have to report before 05/01/19? I do not find an accountant for my LLC, if you have suggestions, please instruct me. Hey Slavko, glad it was helpful! #11 on Form SS-4 is the date the LLC was approved by the state. If your LLC was approved on 1/3/2019, that is the date you would use. The 5/1/2019 is the due date for the Florida LLC Annual Report (I think that’s what you’re talking about). Regarding an accountant, we have some tips here: how to find an accountant. Hope that helps. Thank you Matt, your answer is very quick. I do not know when to submit my first annual report for llc in Florida? When do i send first : before 05/01/2019 or before 05/01/2020? You’re welcome Slavko. Because your Florida LLC was approved on 1/3/2019, your LLC’s first Annual Report isn’t due until January 1st to May 1st of 2020. Hi Matt, I just got a response from the IRS denying my EIN request. I have created an LLC as a single member in WY and IRS requests my SSN or EIN on line 7b of the SS4 Form because on line 7a I appear as Responsible Party. Today, I spoke to an IRS representative and he asked for my Articles of Organization, and I just faxed it with the same SS4 Form, that is, leaving line 7b blank. In your instructions I read that line 7b must be filled in as “foreign”. Question: Should I wait for a new response from the IRS or before it occurs should I send a new form by filling out line 7b with “foreign”? Thank you in advance for your response. Hi Jacky, did they say why it was denied? Yes, I’d wait until you get the next response. Submitting multiples of the same thing to the IRS can cause issues. First, see what they say and then provide us an update if you’d like. If it’s rejected, I’d file a new application and yes, enter “Foreign” on line 7b. Hope that helps. Hi Matt, based on the next IRS response, I’ll be in touch again. Thank you for your response. Hi Matt, just to let you know that today, almost a week after faxing my SS4-Form (second time) and my Articles of Organization, I got my EIN. In my case it was not necessary to write on line 7b. I left it blank. Today I followed up by phone. The IRS service was excellent.